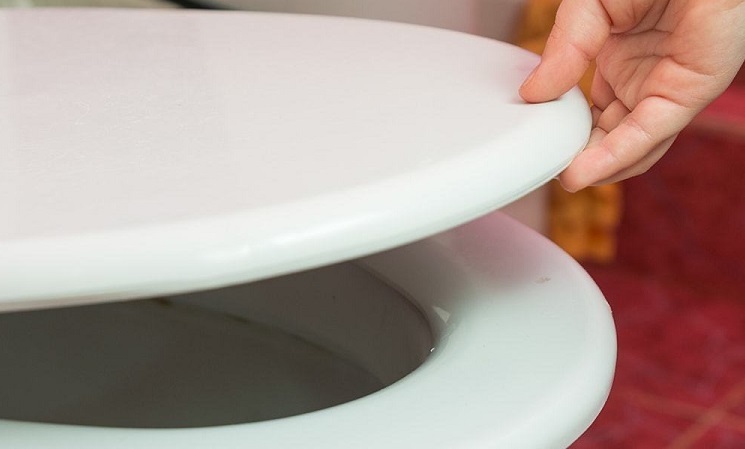 Are you tired of replacing your toilet seat after every six months or less due to cracks, deformations, and excessive fading? 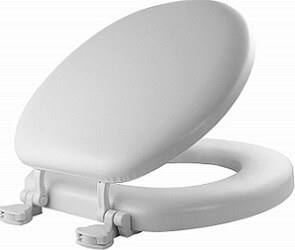 Is your toilet seat so uncomfortable or so hard that you often exit the bathroom even before finishing your business? Or does your toilet seat close in a noisy, irritating bang, waking up everyone in the house? If you answered yes to any of the three questions, then what you need is a well-cushioned, quick-release, slow-closing, and fade & crack resistant toilet seat. In this article, we have reviewed the best-padded toilet seats that will solve almost all of your bathroom problems. Bath Royale Premium Elongated Toilet Seat extremely soft and modern toilet seat is made from a 100% polypropylene material which makes it durable, stain & fade resistant, and comfortable. Being polypropylene also means that this seat doesn’t get cold during winter. It has a quick release button behind its hinges that allow you to remove the seat for thorough cleaning when the need arises. This seat is strong enough to hold a capacity of up to 350 pounds without wobbling, sliding off, or deforming. It has a slow closing mechanism which eliminates the irritating toilet seat & lid bangs and comes with concealed screws which not only hold it well in place but also keeps rust at bay. This seat is designed to fit perfectly on elongated toilets but if yours is around the bathroom, you can always order for the Bath Royale Premium Round Toilet Seat at an affordable price. This product is received together with its installation guide so, even if you aren’t an expert, you can fix it in minutes with just a Philips head screwdriver. This toilet seat is packaged with all its parts pre-assembled and arranged in the order in which you will install them. The package has enough padding material to protect the product from any damages but even in case of any eventuality during delivery, the Bath Royale customer support team is always ready to give you the proper solution. 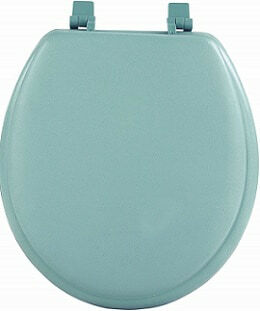 The Mayfair Soft Toilet Seat is the comfort level of this padded seat is unmatched within its price range. It is excellently seamed all round such that it can last for an entire lifetime without coming apart at the edges. The cushioning is nicely done, not overdone actually thus supporting the user perfectly well. Installing, replacing, and cleaning this seat is easy and convenient when using the easy to follow instructions paper that comes with it. Its hinges are lock tight and can support a weight of up to 5.87 pounds without sliding off, breaking, or shifting. To complete its sturdiness, this seat has an internal wood frame that also helps to keep its good looking shape. If you are a fan of matching colors, you will definitely love this seat because of its biscuit shade that matches with nearly all toilet bowls. Another awesome thing about this toilet seat is its warmth level you can comfortably sit on it even on a chilly morning in a cold northern winter. That’s without mentioning how quick the shipping is and how well padded the package is to avoid any breakages. This Ginsey Standard seat is padded in its entirety the lid included. It has a stimulating, plastic core that makes it durable and elegantly designed. Its product dimensions, on the other hand, are approximately 17 x 3 x 15 inches which makes it wide enough for people of all sizes. This product is rich in terms of color choices as it comes in merlot, shimmer butterfly, rose garden white, black, and chocolate just the right colors to light up your bathroom decor. As a matter of fact, this seat would be a perfect choice for a girl’s bathroom due to its beautiful flower and color patterns. It’s quiet, sturdy, and soft enough for a senior citizen or an arthritis patient you can sit on it all day without feeling strained. 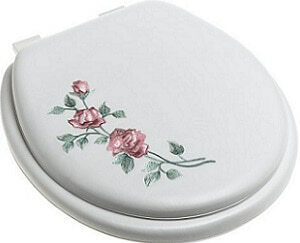 For its price, you definitely cannot get a better quality than Ginsey Standard Toilet Seat. Its screws stay tight and the seamed edges intact for its entire lifetime provided that you maintain it as per the instructions detailed in its user manual. And yes, installing this seat or removing it for convenient cleaning are probably the most natural things you will ever do. You will receive this product very fast after order, it’s well packaged, and rarely will you get a product that you didn’t order for the customer service is excellent too. One thing that you may not like, particularly if you are a male, is that this seat hardly stays up. You will be forced to hold it up when peeing. 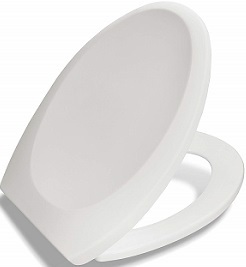 The most outstanding feature in this toilet seat is its many color options they are more than ten including navy, bone, chocolate, light blue, and white. It’s fairly durable for its price and even when the time to replace it comes maybe after two years or thereabouts, you will not feel cheated. The seat has plastic bolts that get tight enough so that you don’t have to keep adjusting them now and then. Besides being pretty, this seat looks more quality than what you would expect for a less than $20 seat. The cushioning, lock system and almost-vinyl material are all perfect for any user below 2.38 pounds. It fits both rounded and elongated toilet bowls so all you need to do for the right shape depending on your toilet’s make. Its assembly isn’t hard either you will be done in minutes. When shopping for the best-padded toilet seat, some of the main things that you must consider include its cushioning, shape, color, durability, and ease of assembly. The four products that we have reviewed in this article meets the five conditions reasonably well and even surpasses some of them. For that reason, therefore, you will be at a great advantage if you settle for any of them. Luxury is key in today’s life and that’s probably why the padded toilet seats cost a little bit more than the ordinary plastic seats but there is more to it than luxury. People suffering from joint or back pains do their “toilet business” at ease and satisfactorily when they use a padded seat than when they use an ordinary seat, consequently improving their overall health. It is true to say that padded toilet seats are more of a necessity than a luxury.